Leman family, Lancaster, Pennsylvania; by descent to Adelia Leman [1857-1947], Lancaster, grandniece of the artist. Acquired, likely purchased from Adelia Leman's estate, in 1948 by Edgar William and Bernice Chrysler Garbisch, New York, and Cambridge, Maryland; gift 1953 to NGA. Helen W. Henderson's opening comments in the brochure accompanying the 1943 exhibition Jacob Eichholtz, 1776-1842, American Artist at the Philadelphia Art Alliance, report: "A peculiarly touching incident was a visit to the outskirts of Lancaster to see the collection of a grandniece of the painter's. She sat in her bower surrounded by these souvenirs of a rich past. A particularly charming phase of the artist's work is a series of small oval portraits on wood. Many of them are family portraits and we were fortunate in procuring four from her collection." Loan Exhibition of Historical and Contemporary Portraits Illustrating the Evolution of Portraiture in Lancaster County, Pennsylvania..., Woolworth Building, Lancaster, Pennsylvania, 1912, no. 156b. Jacob Eichholtz, 1776-1842, American Artist, Philadelphia Art Alliance, 1943, no. 22. The Worlds of Jacob Eichholtz, Portrait Painter of the Early Republic, shown at one of three simultaneous venues: Lancaster County Historical Society, Pennsylvania, uunnumbered catalogue, repro. The support is a vertically grained yellow poplar panel (0.3 cm thick), over which a slightly off-white ground was applied in sweeping vertical strokes. The oval occupied by the portrait is marked by a thin line of deep reddish brown paint. 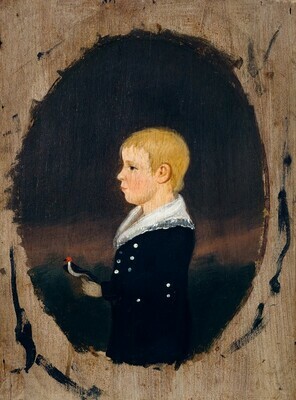 Inside the oval, the background paint appears to have been laid in first, leaving space for the boy and the bird in reserve. The technique is wet-into-wet. Only the white of the collar and the buttons retains texture. The face is badly abraded. Inpainting has compensated for the thinness of paint in the face and is lightly scattered elsewhere. The painting was last treated in 1948, when discolored varnish was removed from the front and a wax coating was applied to the reverse of the panel. The varnish has not discolored. Hensel, William U. "Jacob Eichholtz, Painter." Pennsylvania Magazine of History and Biography 37 (1913): 69. Milley, John Calvin. "Jacob Eichholtz, 1776-1842." Master's thesis, University of Delaware, 1960: 307. Beal, Rebecca J. Jacob Eichholtz, 1776-1842. Philadelphia, 1969: 134, repro. 281. American Paintings: An Illustrated Catalogue. National Gallery of Art, Washington, 1980: 154, repro. American Paintings: An Illustrated Catalogue. National Gallery of Art, Washington, 1992: 171, repro. Kelly, Franklin, with Nicolai Cikovsky, Jr., Deborah Chotner, and John Davis. American Paintings of the Nineteenth Century, Part I. The Collections of the National Gallery of Art Systematic Catalogue. Washington, D.C., 1996: 201, repro. 202.